Students majoring in quantitative sciences (QSS) choose from 16 tracks from across the natural sciences, social sciences and humanities. When Cliff Carrubba helped build Emory's quantitative sciences program in 2014, he and the university were starting down an uncharted path. There were a handful of data-focused majors at universities specializing in technology and engineering, and these programs were designed to help mathematically gifted students find an application for their math prowess. But as big data makes its way into nearly every career and area of study, a need emerged to help students of all kinds use and understand data. The quantitative sciences (QSS) major, the first of its kind, launched in Emory College of Arts and Sciences in 2014 to help students gain a mastery of data and apply it to another area of study such as sociology, political science, economics or women’s studies. QSS majors pick a discipline to anchor their major (which functions much like a double major) and then supplement their knowledge of the discipline with in-depth courses about quantitative theory and methods that teach them to analyze and use data related to that field. The major now has 16 partner majors and 114 students enrolled and specializing in areas such as English; psychology; sociology; economics; biology; women's gender and sexuality studies; and Latin American and Caribbean studies, says Carrubba, director of the Institute for Quantitative Theory and Methods in Emory College and chair of political science. “At this point, there is literally no other program in the country that does this,” Carrubba says. But that will soon change, he adds. Created just two years ago, QSS will graduate 30 students this spring and efforts are underway to expand to include as many as 200 students in the major, says Carrubba. Entry-level courses are filled to capacity and have waiting lists, and the department is making new faculty hires to meet demand. They also are working to develop a minor in the program. Businesses of all kinds, but particularly non-profits and governmental organizations, need well-rounded graduates who both understand the group's mission (poverty, public health, education, etc.) and have the programming and data analysis skills to help organizations most effectively use and analyze data, Carrubba notes. “I think QSS uniquely combines a liberal arts education with meaningful vocational benefits. Instead of thinking of these things in tension, students see why a liberal arts education can make you a better citizen and person but also a successful professional,” Carrubba says. 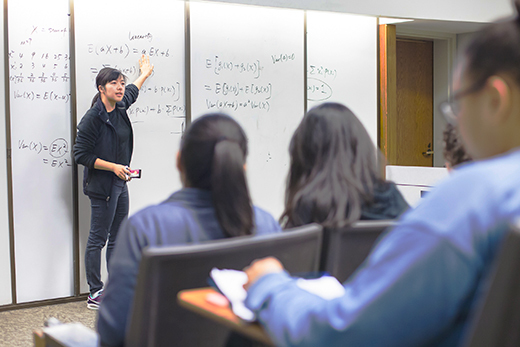 Emory's major is now a model for other data programs designed for non-math/statistics majors. Vanderbilt University and Dartmouth College have been in contact with Emory to create similar programs. Dartmouth has created a major and a minor, Vanderbilt is planning a major, and other universities with a liberal arts focus are likely to follow, Carrubba says. QSS’s list of partner majors or "tracks" has expanded rapidly from the original list (anthropology, political science, history, economics, sociology and psychology) to include areas such as English, biology and Latin and Caribbean Studies. Discussions are underway to add still more partners, including business, film and media studies and public policy, Carrubba says. “The obvious partnerships, like economics, political science and biology, are going to be immensely valuable, but I think the humanities partnerships will lead to some of the most creative opportunities," Carrubba says. "It will produce some of the most unique students that no other program is producing with special career possibilities available to them." Students in the major represent a very broad range of majors and skill sets, says Adam Glynn, associate director of the Institute for Quantitative Theory and Methods and associate professor of political science. “The diversity of interests among the students is staggering. We’re quite happy that we’re seeing students from so many different areas,” Glynn says. While students from economics and life sciences represent a majority, the number of students with a focus area in the humanities has started to rise more rapidly as students realize how vital data can be, he says. “It’s amazing what data you can leverage to study just about any subject,” Glynn adds. Madison Dalton, an Emory College junior majoring in quantitative science and international studies, came to Emory to pursue creative writing, but her interest in international issues led her to QSS. She said as she explored public health and legal efforts underway to improve lives in developing countries, she realized that more accurately analyzed data was needed to help make those efforts more effective. Dalton says she’s really enjoyed her QSS courses and plans to use her data skills in a career in public health or public policy. Anwesha Guha, associate editor for The Emory Wheel and a College junior majoring in English and quantitative science with a concentration in biology, is interested in building a career around data journalism. Data is an important and growing specialty in journalism and combining the study of English with data studies provides her with specialized skills few journalists have, Guha says.